To ask which resort among the three is preeminent is a little like asking, “Which is more important, breathing in or breathing out?”. A rather tough choice I think we all agree. All three properties are magnificent and project their own matchless radiance. Were I forced to choose among them under threat of having to spend eternity in a dingy one-star hotel with neither a spa nor room service (I suddenly feel a cold shiver running down my spine), I suppose I would have to choose the Rosewood in San Miguel de Allende. The reason relates to my opening paragraph, i.e., the setting. For those not familiar with San Miguel de Allende, a veritable mecca for the mentally fatigued, you have no idea what you are missing. To fully grasp just how impoverished your life has been . . . a life which you had hitherto naively assumed was rich and meaningful . . . , I am afraid you will just have to keep reading this blog. The reason being, in the not too distant future I intend to draw upon my highly underrated and, as yet, cruelly unrewarded writing prowess to paint a Monet-esque picture of this magical place. I know, your heart is all a pitter. Patience, dear reader. Coming soon. Meanwhile, you must content yourself with a description of the resort itself. Naturally, you are going to want to spend a great deal of your time exploring this “enchanting artists’ village nestled in the mountains north of Mexico City”. All the more so, I’m sure, after you read my upcoming post. Yet it would be a huge mistake not to carve out significant time during your stay to absorb the atmosphere of the resort’s many charming venues. The “fine” in fine dining begins with the ambiance when you enter a restaurant. The 1826 Restaurant is bathed in old world elegance. 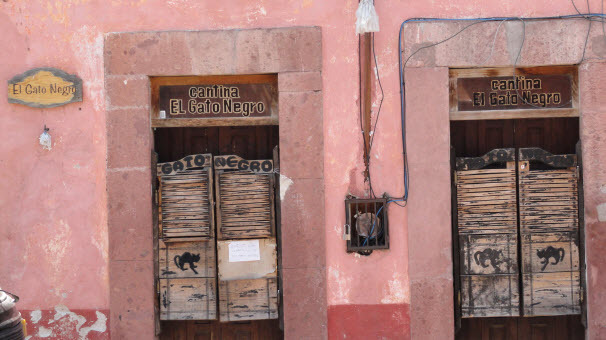 The name of both the restaurant and the bar across the hall commemorates the year the town adopted the name of San Miguel de Allende in honor of Ignacio de Allende, the hero of Mexican independence. The restaurant features an open artisan kitchen and offers the choice of dining indoors or al fresco on the patio amid the vibrant gardens. Another incredible dining option is the Luna Rooftop Tapas Bar. As a regular reader, you have likely noticed my palpable love of both lowbrow humor and tortured puns and therefore might be bracing yourself for me to make a crude play on the bar’s name. I shall surprise both you and me by letting the opportunity pass without comment. Goodness, I suddenly feel abnormally mature. The climate of San Miguel is very temperate year round which lends itself to spending countless hours on the Luna Rooftop. You will find it the ideal setting for gazing out across the sprawling village below and thinking fondly about your smug brother-in-law back home, the one who warned you against going to Mexico, grilling bratwurst in his backyard surrounded by his little screeching, sawed-off savages while navigating nasty love notes delivered indiscriminately around the yard by the family dog. Ah, life is good at the Rosewood! In the travel industry, unique is a term that gets bandied about a little too casually. In the most literal sense, I suppose, every hotel or resort is unique in the same way that every fingerprint and snowflake are. But I think what we all intend to convey when we employ that shopworn adjective is a hotel or resort that is distinctive, idiosyncratic and exceptional. Today I want to tell you about a resort that richly deserves the appellation because it meets all three of those criteria. On a recent “business trip” to the Riviera Maya south of Cancun (nudge, nudge, wink, wink) I decided to solicit a side trip to a resort I had heard raves about but had never visited. I am referring to the Rosewood Mayakoba. 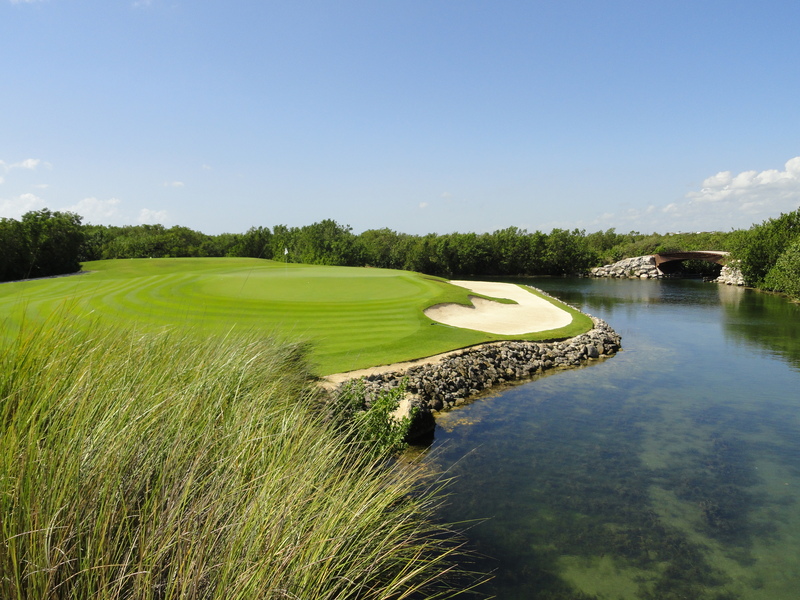 One of its primary attractions for me, and this will come as no shock to either of my friends, was the fact that the resort lays claim to El Camaleon Mayakoba, a signature Greg Norman, 7000 yard, 18-hole championship golf course. It is the only golf course in Mexico with the distinction of hosting an annual PGA Tour event, aptly named the Mayakoba Golf Classic. So naturally, when this . . . ahem . . . “business meeting” (you gotta love the travel business) found its way onto my calendar, my first action was to send off an obsequious email to the Director of Sales requesting an opportunity to tour the facility and, oh, by the way, would it be possible for me and a few friends to experience a round of golf. I am happy to report that my request was met with a generous offer for a round of golf for four (at a discounted rate) followed by a lunch and one-hour tour given by Renata Moreira, Director of Sales and a delightful soul. One of the unique (there’s that word again) features of the property are the canals that run throughout. In fact, this picture to the right shows the lobby area on the upper level. When you check in, you descend the steps and are delivered to your room in one of the water taxis you see in the picture. The canals give the resort a special ambiance, particularly at night when there are lights all along the banks. Just six weeks ago, Rosewood announced the opening of Sense, A Rosewood Spa, named a best spa by readers of Conde Nast magazine. In their own words, “The 17,000-square-foot Sense spa is ensconced on its own island melding water and earth to reflect the nurturing soul of the Riviera Maya.” It can nurture me anytime it cares to! Follow the Sense link for a full press release about this newest addition. 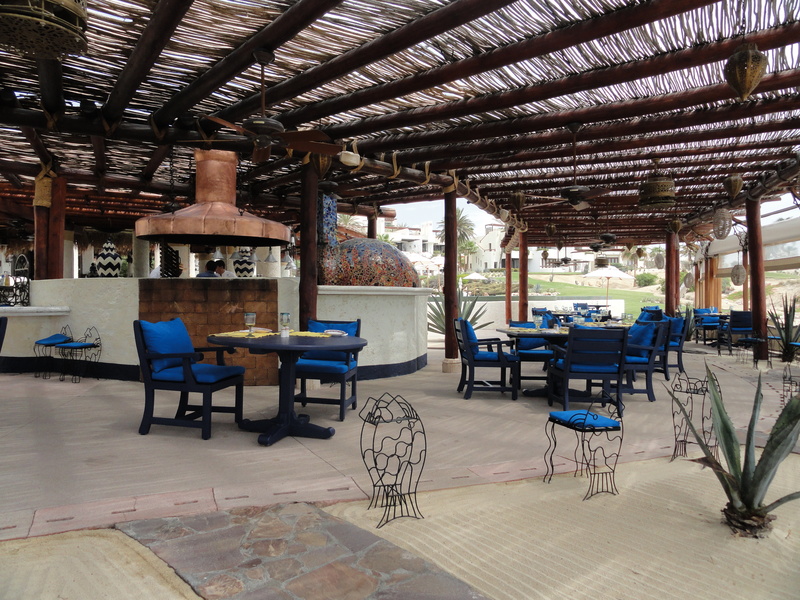 If you visit, you will probably want to while away more than a few hours at Agave Azul, Tequila, Library and Raw Bar. No, that’s not a typo. I presume it refers to the sushi, not the dress code! Check out the three pictures below. There are two other incredible Rosewood properties in Mexico and I will tell you about both in my next post. I know checking out 5 star hotels sounds wonderful but it is really quite grueling. I am fighting to keep a straight face. If you long to check them out too, you know how to reach me. What is your favorite luxury resort in Mexico?